Amber and Ryan sweet talked past guest, fellow T1D, and long-time diabetes camp enthusiast, Kelly McKeever, into joining a summer edition of the show. Kelly’s had 13+ years at camp and shares what keeps him coming back, now in a medical personnel role. 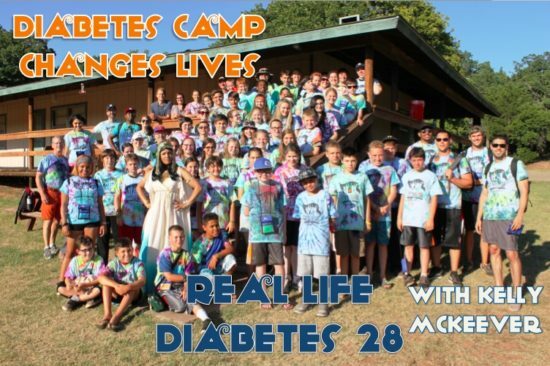 In this episode they catch up on life with diabetes, cutting edge developments in diabetes tech, the camp life experience, what we learned about ourselves, and the value of having “a diabetes community in person”. Do you or someone you know have diabetes? Would you like to share your story? We want to hear how you’ve lived your real life with the disease! Scope out what we look for in a guest blog HERE! Amazon is kind enough to throw a little change our way whenever you click on this banner before shopping for all of your back to school purchases. Congrats – Kelly McKeever is finally a CDE! Last time Kelly joined us, we launched Podcast 12: The Guide To Surviving The Holiday Gauntlet. Amber shares her recent fascination with Omnipod. Did you know that Theresa May, the recently elected U.K. prime minister, is on the T1D team. Ryan did not, surprise. Will you please send us a photo of you smiling? Amber shares her recent Lantus double dosing fiasco days after posting, Unintentionally Sleep Walking Through My Diabetes Management. Scholarships are available. You can donate/send a kid to camp HERE. Kiddos attend for free because of amazing donors and grants. Check out how you can help out HERE. We adore the The Determined Daddies site. Check out this little guy sharing how he changes his pump site. Have an idea for a solid T1D summer camp cheer? Shoot us a comment. Cheers to the highs and lows everyone. The home for the realest diabetes support on the internet. This entry was posted in Fellow Grinder, Group, Mindful, Social and tagged Camp Blue Hawk, Camp Endres, type 1 diabetes camp oklahoma, what is type 1 diabetes summer camp like. Bookmark the permalink.